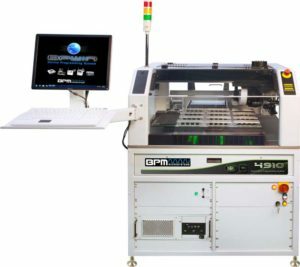 BPM is excited to launch the latest update to our flagship product— the 4910. It’s faster and even easier to operate than any of our previous systems with accelerated on-the-fly alignment, optimized motion, and the most autonomous “Teach” yet. We’ve managed to close the loop on fully-automated teach— making job set-ups faster and more accurate than humanly possible. There’s nothing like it in the marketplace. You can only find it at BPM. Powered by the latest 9th Generation Technology, the 4910 delivers the fastest programming speeds in the industry for MCUs, eMMC HS400, NAND, NOR, and Serial Flash devices. BPM’s 9th Gen technology produces 200 MHz signals, transferring each byte of data in up to 2.5 nanoseconds―up to 9 times faster than competing systems. Our Universal 9th Gen Technology with Vector Engine Co-Processor accelerates flash memory waveforms for programming near the theoretical limits of silicon design. The faster the device, the faster it’s programmed. Combined with BPWin, the most advanced feature-rich process control software in the industry, on-the-fly vision alignment and WhisperTeach+, the 4910 produces more devices per year than any other system. Additional options include our 3D Vision inspection for coplanarity, bent lead, pitch, width, diameter, standoff and X/Y errors. A full lineup of Input/output options is available, along with Raydiance™, our hybrid laser marking system, for clear traceability on even the smallest programmable devices. Finally, BPWin software API tools integrate your manufacturing process for tight inventory control and process management, allowing you to monitor and control each programming job.